In a world where curiosity and wonder are stifled in the name of greater security, and the Sabet Computer Corporation dominates the industry, an unlikely hero emerges. Michael discovers a secret that his grandfather left for him, and as he delves deeper and deeper into the mysterious gift, he is drawn into a world of technology he never imagined. With the help of Atilla, an artificial intelligence training system, Michael battles for freedom of information, open-source operating systems, and curiosity. 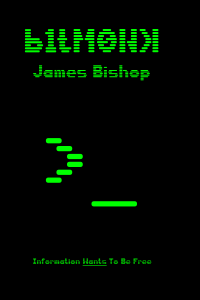 James Bishop’s new book b1tM0NK imagines a world where our current technology and legal system could take us, and warns us of the pitfalls of exchanging freedom for security. While hackers around the world are being criminalized, James Bishop imagines a world in which the hacker is the hero. Available in epub from Lulu.com. Available in paperback from Lulu.com and Amazon. Watch the promotional video here or below.